Competitiveness of the steel and metals industry remains negatively impacted by power costs, which are about 30%-50% higher than in France or Germany. According to the World Steel Association, Spanish steel production increased 6.6% year-on-year in 2017, to 14.5 million tons, while exports increased 5.8%. Domestic steel consumption also increased last year (up 8%). Due to increasing sales prices and higher demand since H2 of 2017, especially from the construction sector, Spanish steel production rose again in 2018, by 3.3% year-on-year between January and July. Profit margins are expected to remain stable in the coming months. The direct impact of US import tariffs on the steel and metals sector is low given the limited share of exports (about 5% of total Spanish steel exports) to the US. While the risk of decreasing steel prices remains, due to surplus exports from outside the EU (especially from Russia and Turkey), it seems that additional safeguard measures set up by the EU will be a strong mitigating factor. The competitiveness of the domestic steel and metals industry remains negatively impacted by power costs, which are about 30%-50% higher than in France or Germany. This is of major importance for the sector, given that 75% of Spanish steel producers work with electric furnaces. Payment experience has been good over the past two years, and both payment delays and insolvencies remained stable in 2017 and H1 of 2018, and are expected not to increase in the coming months. 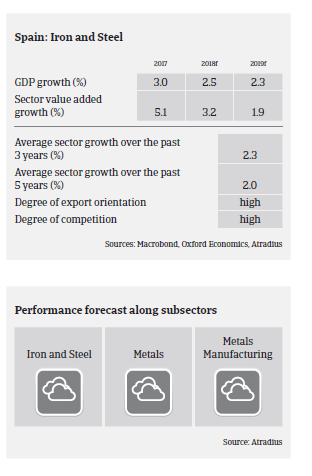 However, our underwriting stance for the steel sector remains neutral to cautious due to the potential downside risks (escalation of trade disputes, eurozone growth deceleration, decreasing demand from major buyer industries like automotive and construction). We closely monitor businesses that are vulnerable to US import tariffs and price fluctuations.